January ushered in more than a new year. It also brought with it unexpected challenges in the forms of death, illness, and being visited by the ghosts of mental health issues past, sky-high anxiety and mild depression. I was more than ready for the start of February to get 2015 back on a positive track, but unfortunately, some of January’s issues have been renewed for February, leaving me feeling like I continue to get repeatedly run over on said track. So, after a week of feeling overwhelmed by worries and stressors, both real and imagined, and dissolving in tears on a daily basis, I decided to run away. Before hitting the trails, adequately prepare. When I get ready to trail run, I have a checklist that I go through before making my way out the door. Proper running gear and shoes-check. Fully charged iPod-check. Water bottle-check. Drivers license-check. Debit card or cash for emergencies-check. Spare house and car keys-check. Once I make sure that I have everything I need, I am ready to take off running. I have made intentions and plans for taking care of myself and coping with life’s challenges, yet once made, I shelved them and have been on autopilot for most of the last six weeks. I need to revisit my plans, in order to prepare for both setbacks and comebacks, each and every day, not just one time. Adequate exercise, proper nutrition, enough sleep, time to meditate, and so on are all ways I can prepare, and so, that’s what I will do. Don’t be afraid to go it alone. As outgoing and social as I am, I run alone. Always. I take the necessary safety measures, and I run in solitude. I have discovered that I truly enjoy my own company and can create moments of pure bliss without anyone else present. It doesn’t feel lonely; it feels liberating, much like it does when I spend time by myself in my own home. Not having a significant other in my life is a void I would like to fill with the right person at the right time, but it doesn’t have to be an abyss in the meantime. When I am at a loss for positive or inspirational words to replace the negative ones that take up valuable real estate in my head, it helps to know that the words of others exist that resonate with me and heal me. When Eddie sang, I listened and was all the better for it! Just keep going. Thanks to recent heavy rains, the trails were the muddiest that I ever have seen them, making the trails slippery and sloppy. With every step, mud quickly caked my shoes and added extra weight to them, and I had to watch my every step. Rather than interrupt my run to try to clean my shoes off, I decided to just keep going. Sure enough, along the way, gravity and force dislodged the mud, leaving me feeling lighter and more agile for the remainder of my run. The problem took care of itself, which reminded me that I do not always need to “fix” things, as letting some situations unfold is all that is needed. Run; don’t over think it. When I trail run, I never worry about what could go wrong. I don’t judge myself harshly. I don’t compare myself to anyone else. I run for myself, and when I take time to do things that engage and nurture my body, mind, baby soul, and spirit, I never regret it. Never. I got out of my own way, and I allowed my body and mind to work together to create a perfect rhythm for a fantastic run. My trail runs are now over, but my hurts-so-good aching muscles and these reflections are reminders of the old and new lessons I discovered and rediscovered this weekend. The challenges that I have been dealing with remain, but at this moment, I feel better equipped to face them and to take much better care of myself in the process. These simple lessons for what can seem to be a complicated and chaotic life are just what I needed to be a trailblazer in my own life. So, off I go. Next Post: Thanks To Me! I am so glad that you did! I wasn’t sure that I conveyed what was on my mind and in my heart adequately, so, it means a lot that you liked it. I love that solution of getting out into nature and doing exercise. It ticks two boxes, three if you count leaving the challenges temporarily behind. Great work! Elizabeth, I love that you can relate to this, and you are spot on in your observations. 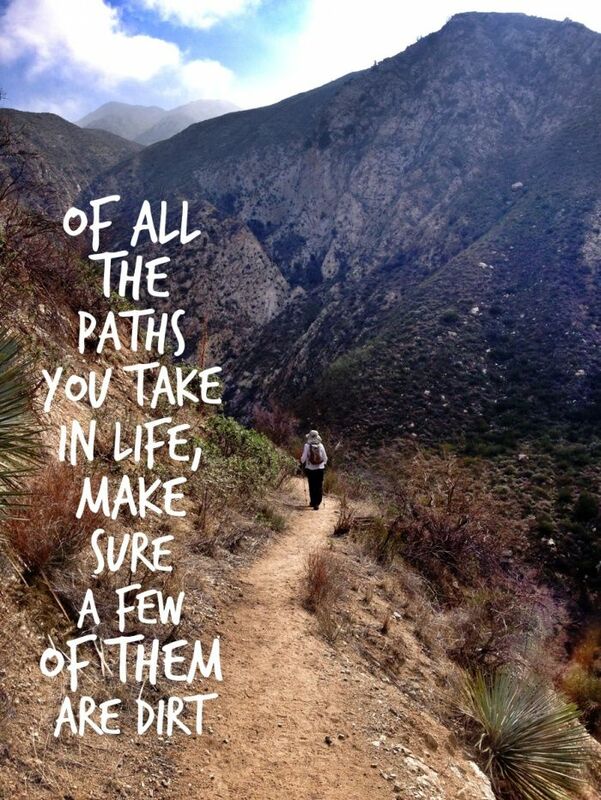 I definitely am making trail running and time outdoors a higher priority in my life. It truly was time well spent. I think that you are right, and I also would like to read the book. Thanks for reminding me to check out “Wild”! Wow-definitely something I need to both read and see! I’m with you all the way on this, except my running days are gone so I walk the trails. Everything else is dead on the money, walking still gets me there. I just take longer to get where I’m headed, and sometimes I do it right inside the city, but 15-20 miles has the effect I need to clear my mind. However, I think I understand well enough where you’re coming from, and there’s just no better feeling. So take care, and enjoy the run. So glad that I am not alone in relishing in life on the trails, whether walking or running. Happy trails to you! Love the quote in the picture. I hit a trail Saturday, but with the leaves off the trees covering some of the trail, I lost the trail a couple of times. Have a great week. Glad you were able to hit the trails, as well. Enjoy your week! Thank you for reminding me how healing it can be to get outside, even when the conditions are not ideal. I don’t have any trails to walk on near where I live, so I’m walking on the street, but I’m walking in a pretty neighborhood with lots of trees and small wildlife. I usually don’t listen to music when I walk, but I might try taking my iPod to help distract me from negative self talk when I’m having a difficult talk. Thanks for sharing how you conquered both your sad feelings and the muddy trail. You are more than welcome, and I love the picture you painted of walking in a pretty neighborhood. There definitely is something about nature, in all its varied forms, that is healing. Sounds like a very sound strategy. I love the time out on my bike on my own – it’s unpressured “my” time. It’s also time when thoughts go in and out of my brain, like they are being cleansed. Thanks for your kind words and for sharing your own experience when you bike. I love the idea of “being cleansed”!